Stock finishes just over $35 a share, valuing the private equity firm at nearly $38 billion, in biggest U.S. IPO in five years. LONDON (CNNMoney.com) -- Shares of private equity firm Blackstone Group jumped about 13 percent in their market debut Friday in the nation's biggest initial public offering in five years - one that's being watched as closely on Capitol Hill as on Wall Street. Blackstone (up $4.06 to $35.06, Charts) stock rose as high as at $38 a share on the New York Stock Exchange, up from its offering price of $31 a share. Volume was more than 113 million shares. What was the top business news story of the past week? Based on the stock's price of about $36 in midday trading, New York-based Blackstone is worth about $39 billion, roughly comparable to a Wall Street firm such as Lehman Bros.
"Very strong showing," said Anthony Conroy, head trader at BNY Brokerage. "The underwriters did a tremendous job placing it in solid hands and the volume on it is just huge." Private equity: End of the golden age? While Blackstone shares jumped, they didn't spike the way shares of hedge fund Fortress (down $1.19 to $24.69, Charts) did when it went public in February. Fortress shares priced at $18.50 a share and finished their first day of trading up 68 percent. Nonetheless, the rise in Blackstone stock has raised the value of chief executive Stephen Schwarzman's 23 percent stake in the company - worth $7.5 billion when shares priced - to $8.7 billion. Co-founder Peter Peterson's 4 percent stake in the firm rose to $1.53 billion from $1.4 billion. Schwarzman will also collect a one-time payout estimated at $677 million from the IPO while Peterson will get $1.9 billion. The gain, while enriching the private equity firm's two founders, raises the specter of more scrutiny from lawmakers over how wealthy partnerships are taxed. The wealth amassed by private equity's power brokers during the buyout binge has become the target of several members of Congress, who claim fund managers benefit from unfair tax advantages. Ranking members of the Senate Finance Committee have introduced a bill to raise the taxes on publicly traded private equity firms like Blackstone. Also raising eyebrows in Congress is Blackstone's agreement to sell a $3 billion stake to China's state investment arm. Sen. James Webb, D-Va., has said the sale raises national security concerns since Blackstone's portfolio includes businesses that develop technology for military use. Despite the threat of higher taxes and greater oversight, investors piled into Blackstone's IPO. Blackstone raised $4.13 billion Thursday when it sold a 12.3 percent stake in the company, making it the biggest U.S. initial public offering since 2002. If underwriters exercise their option to buy additional shares, the value of the offering will be boosted to $4.75 billion. The possibility of bigger tax bills was believed to have chilled the desire of buyout firms to go public, but Blackstone's stellar debut could trigger a string of offerings. Big private equity firms considering an IPO are weighing details of the legislation. For example, the Senate bill introduced last week could give them a moratorium on having to pay higher tax rates if they've already filed to go public. The Wall Street Journal and New York Times reported that Kohlberg Kravis Roberts is planning an IPO, and industry insiders have long speculated that Apollo Management and Carlyle Group may also soon march toward the public markets. Scott Sweet, managing director of IPOboutique.com, said there could be a rush among private equity firms to get to the market in order to avoid being the last one standing. "I would think that the premier names like KKR [Kohlberg Kravis Roberts], Carlyle Group and Texas Pacific would come out before we get to a saturation point," said Sweet. Blackstone's IPO reflects the dominance private equity firms have had on Wall Street in recent years. With its debut, Blackstone's market capitalization of about $38 billion is nearly as large as Lehman (down $2.62 to $76.62, Charts, Fortune 500)'s roughly $42 billion. Schwarzman and Peterson founded Blackstone in 1985 with $400,000 and have since grown the firm into a private equity juggernaut with $88.4 billion of assets under management. 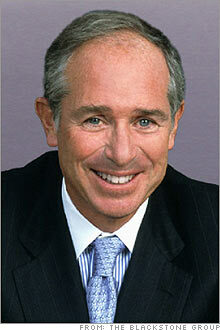 Blackstone's coups include the $39 billion takeover of Equity Office Properties Trust in February. The buyout firm also owns Pinnacle Foods - which makes Vlasic pickles and Aunt Jemima pancake mix - and it led the group that bought chipmaker Freescale Semiconductor. The portfolio companies owned by Blackstone's funds are estimated to employ from 350,000 to 375,000 employees - more than either Citigroup (down $1.22 to $52.44, Charts, Fortune 500) or General Motors (down $0.22 to $35.74, Charts, Fortune 500).